The island of Ibiza is much more than a stage worthy of a postcard that will allow you to keep some beautiful photos of your link. The history of the islands and their people has left a legacy that is worth to approach. Its gastronomy, its traditions and a rich historical and cultural heritage are some of the gifts that this island will offer you during your visit. Also, why not include some genuinely ibicenco detail in your wedding? It is a simple homage to this land that welcomes both its residents and those who are passing through. HERITAGE: From the plane, the Renaissance walls are the main letter of presentation of the cultural heritage of Ibiza. Thanks to them and to other treasures of this land, Ibiza has been part, since 1999, of the list of cities with goods declared Patrimony of the Humanity. Not in vain Dalt Vila is considered the best preserved fortification of the Mediterranean. Next to the walled enclosure, the Phoenician settlement of sa Caleta, where the Phoenicians who from the second half of the 7th century began to write part of the history of the islands, has also been mentioned by Unesco. And also its natural wealth deserves a remarkable chapter. The oceanic posidonia that covers the seabed of Ibiza and Formentera is also considered a World Heritage Site and is responsible for the beauty of the Pitius waters. 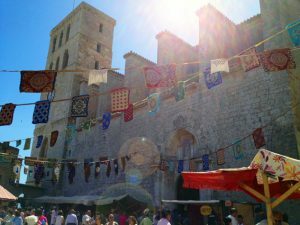 And Ibiza is an island loaded with history (Phoenicians, Romans, Vandals, Byzantines, Muslims and Christians left their mark on them) and attractions that go beyond its more instant beauty. Attractions that can be reached not only by walking through its streets, but also by visiting the Archaeological Museum, the necropolis of Puig des Molins, Madina Yabisah or the Ethnographic Museum of Santa Eulalia. FOLKLORE: Typical dances, attractive both for what they represent (the procession that was done in the old days and in which the woman maintains a submissive role in front of the man, who takes the initiative with his jumps and pranks) and traditional costumes that dress The balladors and that include jewels like the valuable emprendades, that the families coasted with great effort. There are a lot of local groups (colles) that perform dance exhibitions on the occasion of patron saint festivities and that can also be hired to dance on your wedding day. In addition to the dance, the music of the islands includes glosses (which deal with jocular themes and interpret couples), caramelles (typical of the Christmas season) or ucs (shouts that used to serve men in the countryside to communicate) . The musicians or dancers accompany their exhibitions with instruments of the islands such as castanets, xeremia or spasí. GASTRONOMY: This land of constrasts also leaves us a gastronomy in which, as it could not be otherwise, fish are especially prominent, emphasizing the bullit or guisat de peix, and the arròs mariner. Typical are also the arròs de matances, the bones with col, the sofrit pagès or the cuinat, proper of the Holy Week. In the section of baking we discover the flaó, a cake with the Arabian echoes that leaves the peppermint and that is also made with fresh cheese of sheep. A miniflao could be a good gift for your guests visit the section ‘other services for your wedding’. The greixonera (which is made with dried ensaimadas, eggs, milk, cinnamon, sugar and lemon) and the orelletes and bunyols (which are always distributed in local celebrations) are the other sweets that are not missing on the tables of the islands. Nor can we forget the wines of the land or the local herbs. In recent times have been born different wineries that offer a selection of wines that you can include in your menu. The small bottles of local herbal liqueurs are also an excellent gift for the guests and you will also find in the previous section. Up to a dozen different herbs are used to obtain this delicious liquor that can close the best of the meals next to the coffee cove, which mixes the coffee with cinnamon, cognac and lemon.